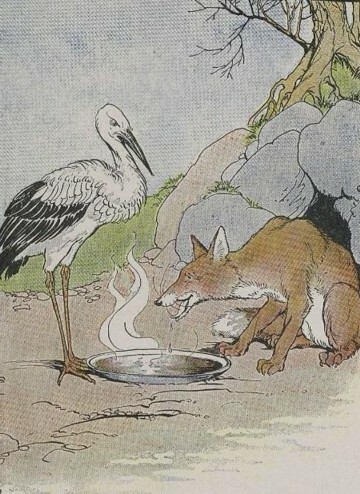 One day, Mister Fox invited Miss Stork for dinner. Miss Stork was very pleased with the invitation and accepted. However, Mister Fox only pretended to be a gentleman and had a very sly personality. He thought about how he could deceive Miss Stork. Mister Fox prepared a delicious soup. He arranged the food on flat plates. It was impossible for Miss Stork to eat from the plate with her long beak. Any effort from the stork to try to grip some food was useless. Miss Stork was so very sad. Mister Fox could easily finish his plate with his lapping muzzle. A few days later, Miss Stork returned the invitation from Mister Fox. Without a moment of hesitation, he replied that he would go to Miss Stork’s dinner party. He hurried to be right on time. 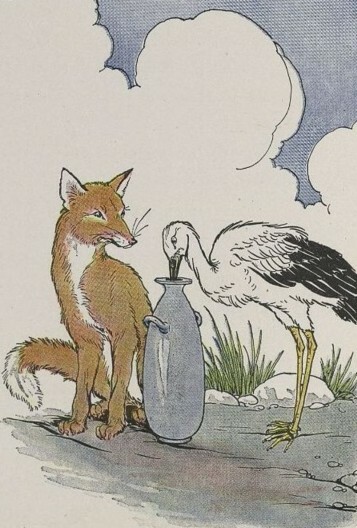 Mister Fox praised the politeness of Miss Stork for the re-invitation. Miss Stork was preparing wonderful meat. She cut the meat in bitesize pieces. The appetizing smell made his desire for the food irresistable. Mister Fox was very hungry. But Miss Stork had made her plan how to serve dinner. She had thought about how she could torture the fox. She arranged the food into tall and slim vases. For the stork, it was a convenient way of eating. Her long beak could go in and out the vase easily. By all means, the snout of the fox wouldn’t enter the vase. The hungry guest had to leave without having any food. Miss Stork had her revenge on Mister Fox.